Recently our tool completed 1 year of our public launch, meaning, we ended our beta. One year passed since we decided that we were ready to have customers and bring them more efficiency with their marketing efforts. Once again, we have great plans for our next steps, strongly based on what we’ve learned from our customers feedback. So, let’s see what our team have been working on. Route has full support for custom attributes of contacts and events, but now we made it easier for you to manage them. Just go to you Settings page and access the Contact Attributes page to create, edit or archive the attributes of your contacts in your Route account. 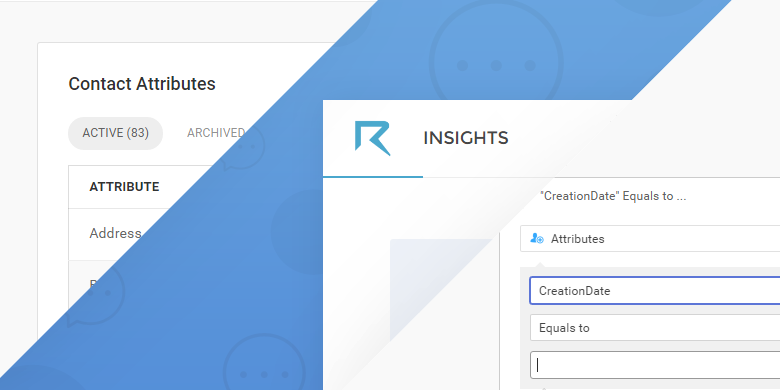 Note that Route automatically creates many attributes for you (mainly related to your contact’s social information) and you can manage them in the same place you can now manage the custom attributes you create. Our content marketers created some epic blog posts teaching you how to do lead nurturing and how to enjoy the best marketing automation for Pipedrive in the market! Sometimes our customers ask us about tips & tricks to do effective lead nurturing campaigns so we decided to write some blog posts about best practices and how to get real benefits from integrating lead nurturing to your marketing and sales strategy (specially if you’re using Pipedrive). And how about our Pipedrive integration? There are many possibilities with our complete two-way integration with the most popular CRM for SMBs and we cover a ton of them in those posts. Now our filters and triggers deal much better with dates and you can segment your contacts by when they where captured into your Route account (with the attribute CreationDate), for example. This was an old request but only recently, when we rewrote completely our internal search and cache engines, we could deploy it. You can wait much more improvements in this field soon. We’re reaching the last part of the Q3/2016 and how about your marketing results ’til now? Did you know that you can improve your marketing and sales productivity automating parts of your business strategy? And you can do this with only 30 days of full commitment in making this happen. Enjoy that Route gives you 30-day free trial and give us a chance to prove that we can help you grow your business.